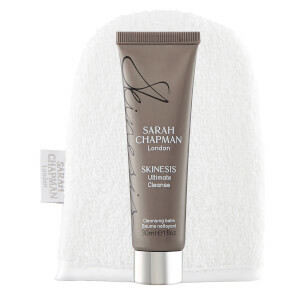 Achieve an on-the-go glow with the Sarah Chapman Skinesis Jet Set Collection 2018, a comprehensive skincare package that will leave the complexion youthful, radiant and glowing. Containing everything you’ll need to cleanse, protect, hydrate and brighten, the gift set is the only thing you’ll need to take with you. Restore a youthful-looking complexion with a formula that uses Light Diffusing LipoLight® and antioxidant Buddleja Davidii plant to deliver protection against UVA, UVB, thermal and infrared radiation to reverse signs of damage and boost elasticity. Smart light scattering powders are combined with optical blurring technology to diminish pigmentation and dark spots for an even tone and brighter, glowing complexion. This silky serum leaves skin looking plumped, rejuvenated and glowing. The treatment mixes a powerful potion of antioxidants, vitamins, Renovage, Omega Oils, Dermaxyl Peptide and natural flower extracts with the brand’s signature skin-brightening complex to give instant results to flat, dull and unbalanced skin, leaving you refreshed and radiant in the morning. Ultimate Cleanse: Massage into dry skin in upward circular motions, allowing the soufflé balm to melt into pores. Add water and emulsify to a light milk and wipe away with a wash cloth or our Professional Cleansing Mitts. For a quick cleanse mix with water and use as a cleansing milk. Skin Insurance: Every morning after moisturising smooth evenly over face and neck. Reapply as required. Infusion Mask: Apply to a cleansed face. Remove the mask from the foil sachet and unfold. The mask has three layers. Remove the outer protective layers. Smooth the mask layer over the entire face. Cover the eyes if required. Leave the mask on for 10-15 minutes. Discard the mask and massage the remaining serum into the skin. Overnight Facial: Smooth or massage into the skin every night. Skin Insurance: Aqua (Water), Homosalate, Ethylhexyl Salicylate, Octocrylene, Ethylhexyl Methoxycinnamate, Glycerin, Butyl Methoxydibenzoylmethane, Potassium Cetyl Phosphate, C12-15 Alkyl Benzoate, Dimethicone, Nylon-12 Fluorescent Brightener 230 Salt, Isomalt, Helianthus Annuus (Sunflower) Seed Oil, Silica, Ammonium Acryloyldimethyltaurate/Vp Copolymer, Octadecenedioic Acid, Saccharide Isomerate, Panthenyl Triacetate, Xanthan Gum, Squalane, Dimethiconol, Ethyl Linoleate, Tocopheryl Acetate, Limnanthes Alba (Meadowfoam) Seed Oil, Dehydroacetic Acid, Lepidium Meyenii Root Extract, Cedrus Atlantica Bark Oil, Lecithin, Cichorium Intybus (Chicory) Root Extract, Ectoin, Polyvinylalcohol Crosspolymer, Stearyl Triethoxysilane, Niacinamide, Polygonum Aviculare Extract, Sodium Starch Octenylsuccinate, Calcium Pantothenate, Maltodextrin, Tocopherol, Buddleja Davidii Extract, Ethyl Ferulate, Jasminum Officinale (Jasmine) Flower Extract, Pelargonium Graveolens Flower Oil, Polyglyceryl-5 Trioleate, Santalum Spicata Wood Oil, Allantoin, Aloe Barbadensis Leaf Juice Powder, Plankton Extract, Vitis Vinifera (Grape) Fruit Cell Extract, Sodium Ascorbyl Phosphate, Rosa Damascena Flower Oil, Pyridoxine HCL, Rosmarinus Officinalis (Rosemary) Leaf Extract, Ethylexylglycerin, Disodium Uridine Phosphate, Dextran, Nonapeptide-1, Cyclotetrapeptide-24 Aminocyclohexane Carboxylate, Butylene Glycol, Alcohol, Oleyl Alcohol, Parfum (Fragrance), Phenoxyethanol, Benzoic Acid, Sodium Hydroxide, Sodium Benzoate, Citric Acid, Potassium Sorbate, BHT, Sodium Citrate, Sorbic Acid, Benzyl Alcohol, Benzyl Benzoate, Benzyl Cinnamate, Citral, Citronellol, Eugenol, Farnesol, Geraniol, Hydroxycitronellal, Linalool May Contain [+/-]: CI 77891 (Titanium Dioxide), CI 77492 (Iron Oxides), CI 77491 (Iron Oxides), CI 77499 (Iron Oxides). Infusion Mask: Aqua, Glycerine, Butylene Glycol, Rosa Damascena Flower Water, Saccharide Isomerate, Peg-40 Hydrogenated Castor Oil, Aloe Barbadensis Leaf Juice, Magnesium Aspartate, Octyldodecanol, Phenoxyethanol, Sclerotium Gum, Hydrolyzed Hyaluronic Acid, Mannitol, Ribes Nigrum Seed Oil , Allantoin, Dipotassium Glycyrrhizinate, Carbomer, Triethanolamine, Xanthan Gum, Helianthus Annuus Seed Oil Unsaponifiables, Sodium Citrate, Zinc Gluconate, Peg-60 Almond Glycerides, Caprylyl Glycol, Cardiospermum Halicacabum Flower/Leaf/Vine Extract, Tocopherol, Helianthus Annuus Seed Oil, Rosa Damascena Flower Extract, Iodopropynyl Butylcarbamate, Copper Gluconate, Rosmarinus Officinalis Leaf Extract, Acetyl Tetrapeptide-15, Nordihydroguaiaretic Acid, Oleanolic Acid, Citronellol, Geraniol. Overnight Facial: Cetearyl Octanoate, Simmondsia Chinensis Oil, Cyclomethicone, Ethylene/Propylene/Styrene Copolymer, Butylene/Ethylene/Styrene Copolymer, Di-Ppg-2 Myreth-10 Adipate, Caprylic/Capric Triglyceride, Tetrahexyldecyl Ascorbate, Peg-4, Hydroxycinnamic Acid, C12-15 Alkyl Benzoate, Teprenone, Tribehenin, Ceramide 2, Peg-10 Rapeseed Sterol, Palmitoyl Oligopeptide, Phenyl Trimethicone, Citrullus Vulgaris Oil, Adansonia Digitata Seed Oil, Cannabis Sativa Seed Oil, Limnanthes Alba Seed Oil, Crambe Abyssinica Seed Oil, Cedrus Deodara Oil, Tocopheryl Linoleate, Hyacinthus Orientalis Extract, Jasminum Grandiflorum Flower Wax, Santalum Album Oil, Ubiquinone, Limonene, Retinyl Palmitate, Linalool, Citrus Grandis Oil, Pelargonium Graveolens Oil, Lavandula Angustifolia Oil, Cananga Odorata Oil, Thioctic Acid, Rosa Damascena Oil, Geraniol, Citronellol, Plumeria Alba Extract, Aniba Rosaeodora Oil, Benzyl Benzoate, Citrus Aurantium Bergamia Oil, Anthemis Nobilis Oil, Polianthes Tuberosa Extract, Eugenol, Benzyl Salicylate, Benzyl Alcohol, Farnesol, Citral, Hydroxycitronellal, Cinnamyl Alcohol.